"A clear, balanced, and up-to-date guide to dealing with issues arising from the menopause - it couldn't have come at a better time." As the variety of treatments to alleviate the physical and psychological symptoms of menopause continues to expand, doctors are encouraging women to take an active role in choosing treatment options for themselves. 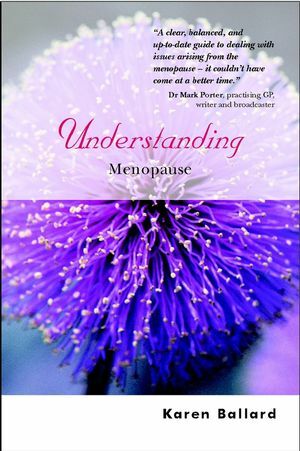 Understanding Menopause will help you to make these decisions by providing clear, unbiased information about all aspects of menopause, as well as first-person accounts by women of their psychological and sociological menopausal experiences. Written by an expert in women's health, this reader-friendly guide bridges the gap between medical knowledge and everyday life to help you cope with the menopause both physically and mentally. Karen Ballard is a medical sociologist with a particular interest in women's health issues. She has carried out extensive research into women's experiences of the menopause and their use of hormone replacement therapy. She is an academic at King's College London, where she works in the department of General Practice and Primary Care. Chapter One. Biological Changes During the Menopause. Chapter Two. Experiencing Symptoms During the Menopause. Chapter Three. Treatments for Heavy Bleeding. Chapter Four. The 'Change of Life'. Chapter Five. Keeping Healthy After the Menopause. Chapter Six. Changes in the Menopause Over Time. Chapter Seven. Non-Hormonal Therapies for the Menopause. Chapter Eight. Hormonal Treatments for the Menopause. Chapter Nine. Contraception After the Age of 40.